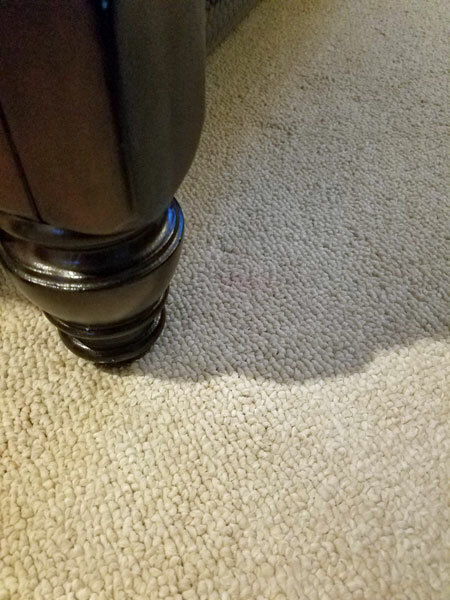 These before and after photos of a residential stain removal in Tampa FL show how to remove makeup from carpet. I run into a lot of stains in my profession as a carpet cleaner. Each type of stain creates specific problems. 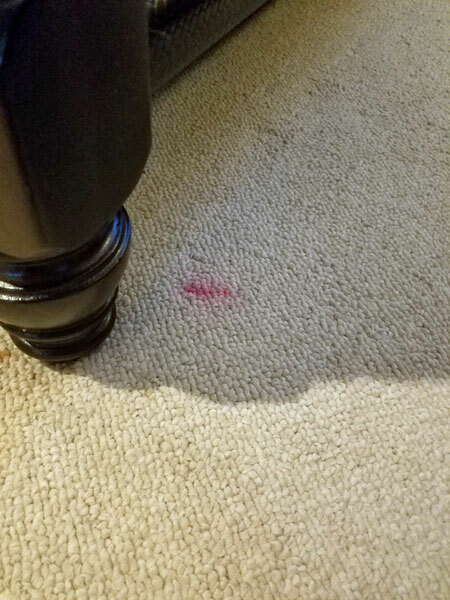 A really common stain that I run into on a regular basis is makeup in the carpet. A lot of younger ladies have gotten into the habit of sitting on the floor to put on their makeup. Eventually that makeup is going to get into the carpet. Although , makeup can be difficult to get out of carpet it can be removed with the right solutions. A lot of makeup is water based. like eye shadows, foundations, and mascara, they can be removed quite easily with a common carpet cleaning solution. I recommend mixing 1 cup of water, 1 cup of vinegar, and about 5 drops of dish washing soap. apply ti to the makeup spot and blot it out with a clean white towel. Repeat until the spot is gone. Lip stick and nail polish are oil based stains and require a different approach. Your best way to get out one of these stains is to use nail polish remover. Make sure its clear and odor free before cleaning with it. Pour some nail polish remover onto a clean white towel and then blot the makeup spot to remove the stain. The key to success in removing oil based makeup from carpet is patience and time. Keep using the nail polish remover until the spot stops transferring to the towel. Then use a water based cleaner to remove the rest. That's how to remove makeup from carpet. If you are not able to remove the makeup spot completely, then it's time to call in a professional carpet cleaner. Need to remove makeup from your carpet call Chem-Dry of Tampa FL.